Property owners and purchasers in Wisconsin may be required to submit a statement of taxes. This summarizes all the taxes which have been levied in connection with the property. This form is available on the website of the Wisconsin Department of Revenue. 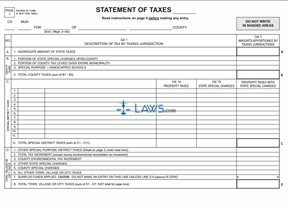 Note that this form must use data from a tax roll produced by your county or a data processing center. This tax roll must have been checked for accuracy. Wisconsin Statement Of Taxes PA-5632 Step 1: Enter your county or municipality, city and county at the top of the page where indicated. Wisconsin Statement Of Taxes PA-5632 Step 2: In section A, enter the total sum of state taxes charged. Wisconsin Statement Of Taxes PA-5632 Step 3: In section B, enter all county taxes assessed. Wisconsin Statement Of Taxes PA-5632 Step 4: In section C, enter all special district taxes. Wisconsin Statement Of Taxes PA-5632 Step 5: In section D, enter all town, village or city taxes in the categories as indicated. If there are any other special purpose district taxes noted in section D1, detail these on the third page where indicated. Wisconsin Statement Of Taxes PA-5632 Step 6: In section E, list all taxes assessed by school districts. In section F, list all taxes assessed by technical colleges. Wisconsin Statement Of Taxes PA-5632 Step 7: In section G, summarize all general property taxes as indicated. Wisconsin Statement Of Taxes PA-5632 Step 8: In section H, note special assessments and charges. Explain these in detail on the third page under "Section H - Detail Summary." Wisconsin Statement Of Taxes PA-5632 Step 9: Sections J and K concern taxes levied on the property which were not in effect the previous year and taxes due or refunded. Wisconsin Statement Of Taxes PA-5632 Step 10: Sections M and N concern taxes levied on agricultural land. Wisconsin Statement Of Taxes PA-5632 Step 11: Section O concerns taxes levied on coal, grain, petroleum refineries and iron ore concentrates. Wisconsin Statement Of Taxes PA-5632 Step 12: Section T is an aggregate of all taxes noted in sections G, G-6, H, J, K, M, N and O.
Wisconsin Statement Of Taxes PA-5632 Step 13: Fax the form to the Wisconsin Department of Revenue at the number listed in the instructions.